What if that kid you and your friends picked on in your youth came back with a vengeance...to kill you and your friends? 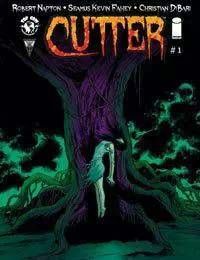 That dark guilt-ridden fear is at the core of CUTTER, a cautionary tale about the sins of your past coming back to haunt you. Jeremy lives a quiet life with his wife in a rural town. Successful and stable, Jeremy is the guy next door. But he and his high school friends share a dark secret. And when that secret literally comes back to haunt them, Jeremy must confront his past and his own sanity as he comes face to face with a vicious serial killer...The Cutter.